Luciana Souza was teaching at the Berklee College of Music when Miguel Zenón arrived there from his native Puerto Rico in 1996, and she remembers all the talk the new student was soon generating in the college’s hallways. 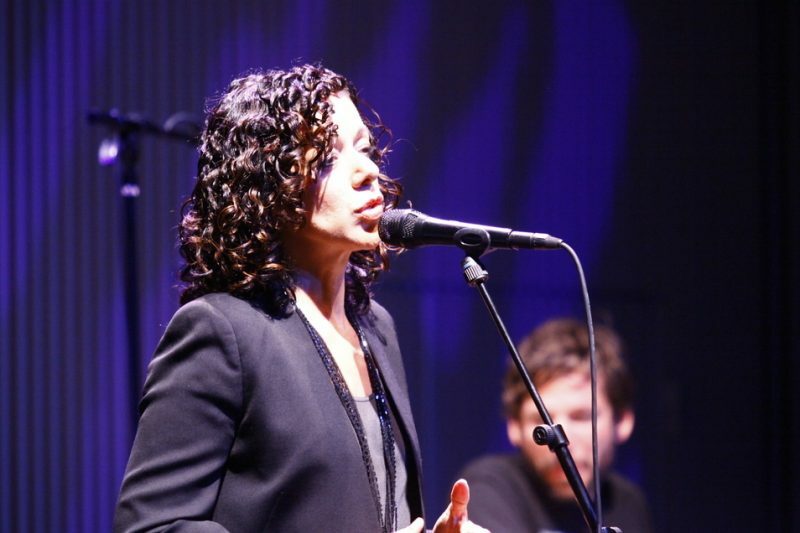 “We all knew that there was someone who would change jazz,” she told the audience from the Miner Auditorium stage at SFJAZZ Center, where she was performing with Zenón’s longtime quartet on the third night of Zenón’s recent four-night residency there. That hallway gossip looked prescient throughout Zenón’s run at San Francisco’s sparkling 18-month-old answer to New York’s Jazz at Lincoln Center. The alto saxophonist was wrapping up his second and final season as one of the Center’s handful of resident artistic directors (Bill Frisell, John Santos, Regina Carter and Jason Moran are the others), and he used the occasion to focus on Latin Americans and jazz, with the help of a series of special guests. For the most part, that meant having the guest artists join Zenón’s quartet with pianist Luis Perdomo, bassist Hans Glawischnig and drummer Henry Cole. But opening night, a Thursday, was a duo performance with another of Zenón’s early mentors, the Panamanian pianist Danilo Pérez. 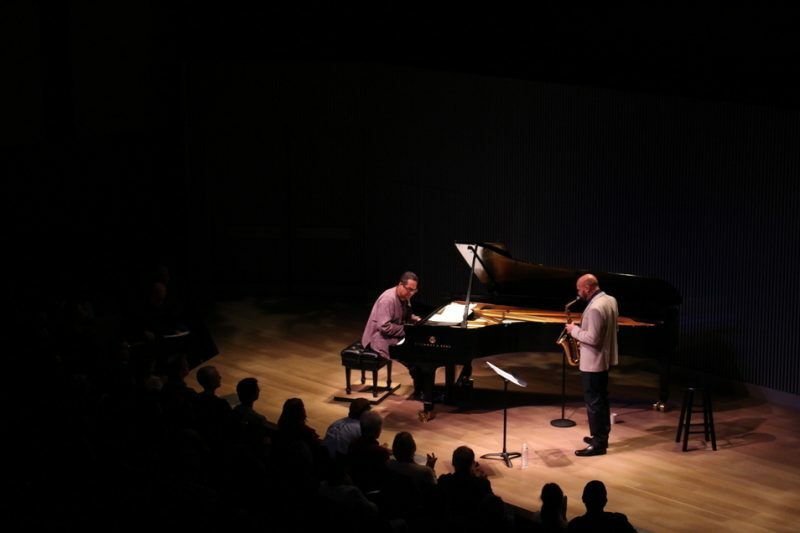 Perdomo and Glawischnig were in the audience as the duo led off by premiering the Zenón composition “La Izquierda Latino-Americana” (“The Latin American Left”), sheet music arrayed across the piano as Pérez’s left hand sounded the tune’s the opening chords. Two other new Zenón pieces were debuted that night, titled “La Libertad” (“Liberty”) and “Centro de Gravedad” (“Center of Gravity”). Newish Pérez work was also featured, the tunes “The Expedition” and “Panama 500,” duo versions of work on his recent release Panama 500. The emphasis that night was on impressionistic lyricism rather than Latin heat. You could sense the Spaniards traversing in Panamanian jungle in “The Expedition,” the celebrants toasting the occasion in “Panama 500,” Pérez’s disgust with a recent American president in “Cobilla”-the last of which Zenón described wryly as coming “from the very, very beautiful but twisted mind of Danilo Pérez.” Each man contributed five compositions to their collaboration, and Zenón led Pérez into the Latin American standard “Irremediablemente Solo” when they returned onstage for an encore, a tune Zenón knew Pérez had recorded on his first album as a leader (it also appears on Pérez’s more recent Providencia). “This musician served as an example for me,” Zenón said of Pérez. 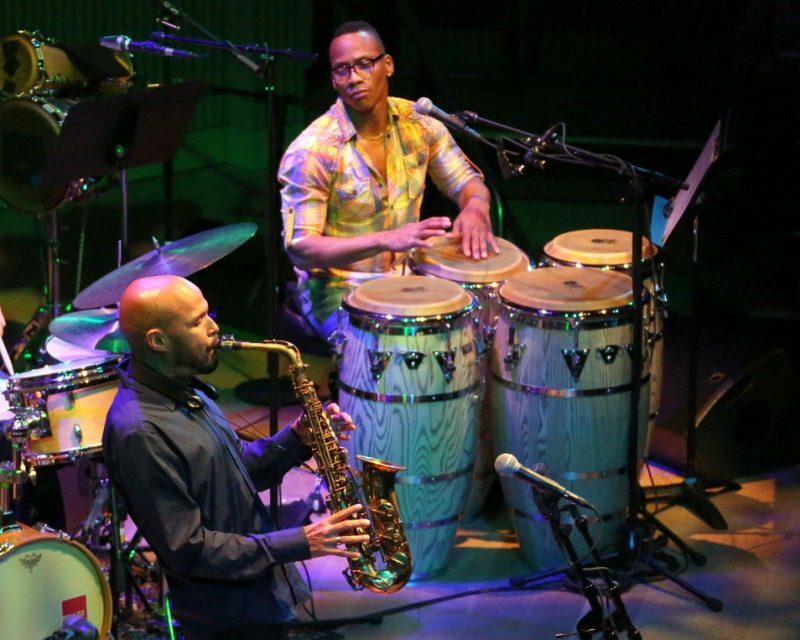 He recalled how, despite considering himself a “shy guy,” he had bounded onstage after a Pérez performance to introduce himself, and how the Boston-based Pérez had invited him to his home to hang out and play together. Playing together is something Zenón and Pérez very rarely get the chance to do anymore, owing to their separate thriving careers. But their rapport was palpable, and Pérez didn’t seem the least bit tired onstage despite having just returned stateside from a trip to western Africa. “I can’t tell you how much fun it is to be up here with this amazing musician,” Zenón told the audience as they were about to wrap up the scheduled program with Pérez’s “Galactic Panama.” But he didn’t need to: It was right there in front of them for all to see and hear. Friday night’s focus was on rhythm and the plena tradition of Puerto Rico, which Zenón had introduced to the jazz world on his 2009 album Esta Plena. The first half of the evening was given over to Héctor “Tito” Matos and his five-piece group Viento de Agua, with Joksan Ramos (seguidor), Eric Noel Rosado (Segundo), Guillermo “Willie” Cubero (guiro) and Luis “Lagarto” Figueroa (requinto). Matos, aside from handling lead vocals, explained the function of each of the band’s hand-held percussion instruments, describing plena as “music for humble people, working-class people, and we’re really, really proud to represent this tradition.” He played washtub bass on one tune, and the whole group switched to various-sized cowbells for Matos’ arrangement of “Ola de la Mar.” But mostly they stuck to their drums and their energetic storytelling, on tunes such as “El León” (the tale of a lion escaping from the Mayaguez zoo) and the Juan “Llonsi” Martínez classics “Pa’ un Plenero” (a lament for a departed plenero) and “Las Tarimas” (a celebration of the street corner as the pleneros’ true stage). Zenón joined them for the final tune of their set, his alto sax joining the drummers’ vocal response to Matos’ lead. And Matos, Ramos and Rosado joined the Zenón quartet for the show’s second half, Matos taking over for Figueroa on requinto. The musicians worked their way through a selection of four tunes from Zenón’s album-“Villa Palmeras,” “Esta Plena,” “?”yelo” and “¿Qué Será de Puerto Rico?”-the objective being, as Zenón explained two songs into the set, “to pay tribute to this amazing style of music, and also try to find a crossroad” where it can intersect with jazz. Zenón himself served as a bridge here, proving himself no dilettante by singing lead on “?”yelo” and backing vocals elsewhere, while alternating brilliant instrumental solos with Perdomo (Cole took one as well, on “¿Qué Será de Puerto Rico?”). The pleneros augmented the quartet, one of the best working units in jazz, without disrupting its finely honed rapport, and the result was all the more satisfying for the rare chance to witness this music live. As an encore, Zenón chose “Despidida” (“Farewell”), his selection inspired by the New Year’s Eve parties Matos hosts annually (in a couple of spots his alto quoted “Auld Lang Syne”). Saturday’s show with the quartet joined by Luciana Souza shifted focus somewhat to her native Brazil, though room was made for one more tune from the album Esta Plena, Souza wrapping up the evening’s first half by singing “Pandero y Pagode” in Portuguese (which she had decided would work just as well as Spanish). For the most part, the pendulum swung back to Thursday night’s emphasis on lyricism. The performance opened with the great Cuban folk singer Silvio Rodríguez’s “Pequeña Serenata Diurna,” which Zenón had meant to record with Souza on his debut album; a family matter caused her to miss the session, so he recorded it as an instrumental on Looking Forward. “But hey,” he told the SFJAZZ Center audience, “we just did it now, 18 years later.” Brazilian classics included Milton Nascimento’s “Tarde” and a pairing of Chico Buarque’s “As Vitrines” and the Elis Regina-associated “As Aparencias Enganam,” the latter two stitched together by a Perdomo piano interlude. Souza contributed three pieces of her own: “Straw Hat,” “No Wonder” and the recent “Filhos de Ghandi” (“Children of Ghandi”). “I’m going to bring the simplest songs,” Souza said she had told herself, introducing the last of these, written as Nelson Mandela lay dying to celebrate “these people who were here to change humanity.” Her idea had been to balance her tunes’ simplicity with Zenón’s more lushly complex contributions, which aside from his arrangements included two recent pieces of his own to which he had added lyrics for Souza to sing. “More to Give,” which he’d recorded without lyrics with the SFJAZZ Collective, and “Sangre de mi Sangre” (“Blood of My Blood”), which his quartet had performed once before in public, were heartfelt tributes to his wife and young daughter, respectively (who joined Zenón in the lobby as he mingled with the audience and signed CDs after each night’s show). And Zenón and Souza ended the evening with a duo performance of Cartola’s wistful “As Rosas Não Falam” (“Roses Don’t Speak”), Zenón blowing a fluttery accompaniment to Souza’s singing and tambourine. The emphasis that last night, however, was on the new. Zenón premiered his arrangements of three pieces “Baba Cuello Mao” and two Pablo Milanes songs, “Nelson Mandela, sue dos Amores” (which quoted the South African national anthem) and “Homenaje”-as well as an evocative new composition of his own, “Ciclo,” which led off with Glawischnig’s bass and incantatory vocals from Martinez and provoked a particularly rich and supple solo from Perdomo. “The Center is one of the best places to play in the world,” Zenón told the audience when “Ciclo” concluded, praising the way its residencies encourage artists to risk trying new things. And his own residency proved that Zenón, the sole remaining founding member still touring with the 10-year-old SFJAZZ Collective, embodies SFJAZZ’s forward-looking, international approach to repertoire and new music as well as anyone. The idea here is to respect the past without being hamstrung by it, and Zenón’s delicious choice for an encore that final night was a perfectly apt demonstration of how that can work. He and Martinez returned to the stage alone and launched into one of the earliest and best-known contributions of Latin America to jazz. There was no need to name the tune: Juan Tizol’s “Caravan,” made famous by Tizol’s employer Duke Ellington in the 1930s. Zenón kept referring to and taking liberties with the familiar melody, gently lyrical one moment and taking things out a bit the next, and he did what amounted to comping on his alto when Martinez took the lead on congas. The encore didn’t last long, but nothing could have sent the audience home happier.